7 Kids and Us: Fun This Summer with Peppa Pig! I can't tell you how many times we have watched Peppa Pig. My boys have been watching it for years, and they still love it! 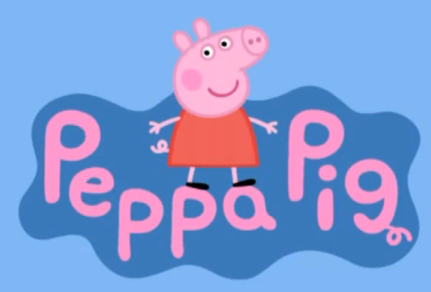 I like that Peppa is sweet, and wholesome, and I don't have to worry about what they are watching. This summer your kids can have fun with Peppa all day long with the Peppa Pig play mat from TCG...it is a mat which is printed on over 5 feet of EVA foam, this full color playmate lets you explore the world of Peppa Pig! features clean, finished borders, wipes clean and rolls for easy storage. I love the fact that if they spill anything which sadly no matter how much I say not to bring drinks out they will and do, so the clean up is very easy with the rug. 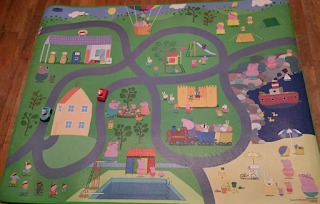 The girls had some other playset from Peppa Pig that they enjoyed placing all over the play mate. It has provided many hours of play and rolls up for easy storage. 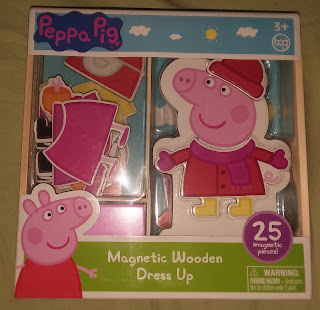 The Magnetic Wooden Dress Up set is definitely a favorite! It's a Peppa Pig fashion show! With a selection of tops and bottoms, create fun outfits for any occasion with this Magnetic Wooden Dress Up kit. Features chunky, easy to grip magnetic wood pieces, fun scenes and a wooden storage box for easy clean-up. My kids had a lot of fun changing the clothes on Peppa and deciding which outfit was for which day. You can find the new Peppa Pig products and you can find them at your local ToysRUs and on Amazon.